JAWS are an English alternative rock band formed in Birmingham, England in 2012 after singer Connor Schofield had posted a demo (Cameron) online that received enough positive feedback to encourage him to start a band with friends from Halesowen College. They have often been identified as part of the Digbeth-based B-Town scene and hotly tipped as ones to watch. JAWS have published two EPs and two full length LPs so far. The B side of “Surround You”—”Stay In” featuring on the Ubisoft game Rocksmith 2014. “Gold” was featured in an episode of Hollyoaks. They have toured with The Twang, Peace, Swim Deep, Spector as well as various support slots. In December 2013 the band announced via their Facebook page that they would be recording a full studio album in 2014 partially funded by the PRS. In April their next single will be released called “Think Too Much, Feel Too Little”. In June 2014 the band announced the Debut album “Be Slowly” would be released on 15 September that year. 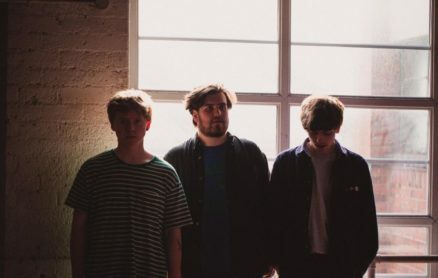 The band announced over Twitter a tour in September, stopping at Birmingham, Newcastle, Glasgow and plenty more, supported by Fickle Friends, Milk Teeth and Brawlers. On 27 April 2015, JAWS shared the standalone single “Bad Company” via Huw Stephens Radio 1 show. On 27 May 2014, the band announced their debut album “Be Slowly” set for release on 15 September. The title song “Be Slowly” was recorded & produced by Oliver Horton AKA Dreamtrak (Swim Deep, Foals, Cymbals) That day they also uploaded the title track to Soundcloud, as well as making the album available for pre-order. On 23 September 2015, JAWS released the audio for “What We Haven’t Got Yet” the first single from their new album. They then went on to release a music video for the song on 15 October 2015. They also released the audio and later a music video for the single “Right In Front Of Me” as well as audio’s for “Work It Out” and “Just A Boy” and a Music video for “Cast” which was released on 5 April 2017. The album was released on 4 November 2016.